Just found that in Gmail address book, QQ was added in the IM option list. QQ is the most widely used IM in China. When ICQ was getting popular at the end of last centry, QQ, previous called QICQ, caught the chance in China. 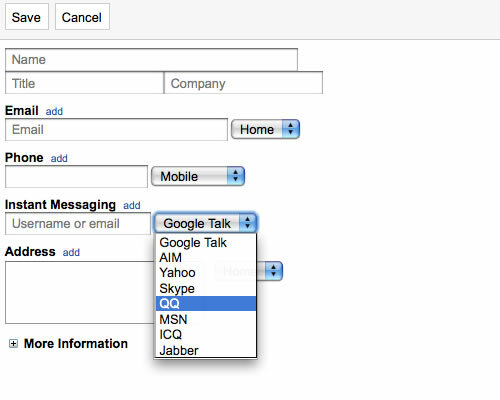 Compare to MSN, ICQ or other IMs, QQ has the local advantage. In China, it has become a standard contact method for long. Now it's added in Gmail address book too. I have a QQ number of 6 digits, which could be valuable now. In another hand, now a long QQ number is hard to remember. The English version of QQ for Windows is available here. And a Mac version too. There are 2 responses to “Small change in Gmail Contact”. I forgot my ICQ number, haha.